It’s September in Wells-next-the-Sea, whilst the beaches are noticeably less populated, the queues at the fish and chips marginally shorter, the small seaside town was buzzing with pirates and over 20 Paint Out artists, the weekend of 15-17 September 2017. These weather-hardened outdoor painters, unique among artists to leave the warmth and walls of the studio, visited Wells in the third year of this festival of plein air art competition event. The now annual event has established a visible pop-up presence for art in the form of an artists’ hub in the Congregational Hall and marquee gallery on the Buttlands. 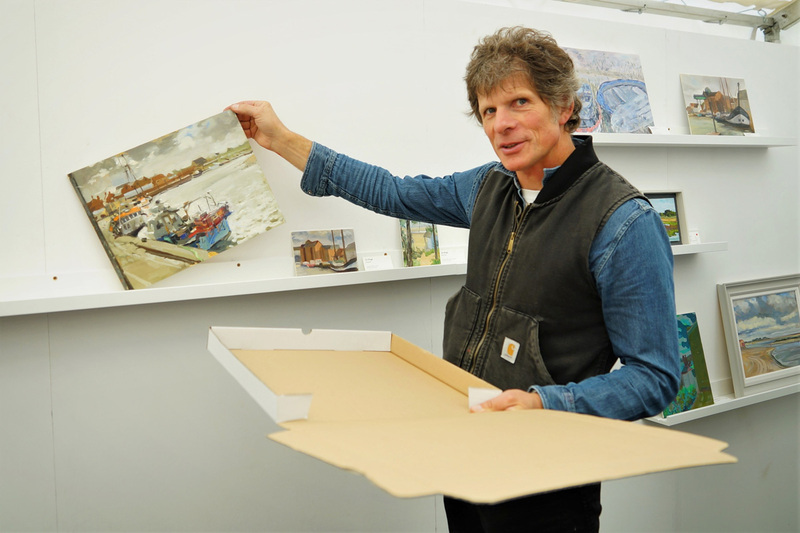 Many hundreds visited the exhibition of 120 artworks painted during the weekend, from sunrise to sunset, from North Norfolk’s Wells’ beach to Blakeney’s boats. Fast becoming a must-do event in the art and festival calendar, more people than ever encountered the artists painting the North Norfolk coast, returning to the tent to see the works come in, get their tickets, and go on display. The largest painting of over 1m square, titled “East Hills Dawn” by local artist Tom Cringle, was painted at dawn on the beach, and sold within minutes of going on display. 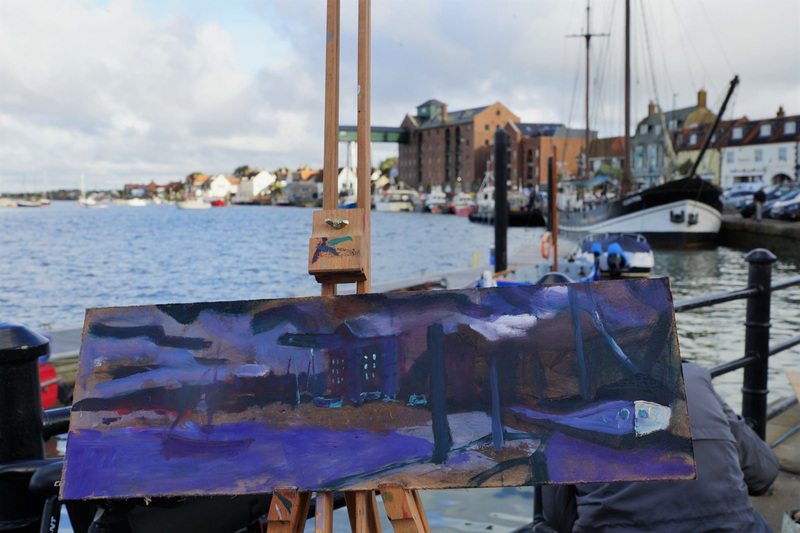 Tom was among 21 brave artists who rose before 5am to watch and paint the superb sunrise on both the beach and pre-dawn purples and oranges appearing as beautiful backdrop to the silhouetted Albatros on the quay, where several artists stayed during the weekend. The painting competition judges – art dealers and valuers, James Glennie and Nick Holmes, along with experienced plein air artist Michael Richardson – considered long and hard over the artworks but were nigh on unanimous in their choice of Jack Godfrey’s bold widescape, “The width of Wells”, as first prize winner. 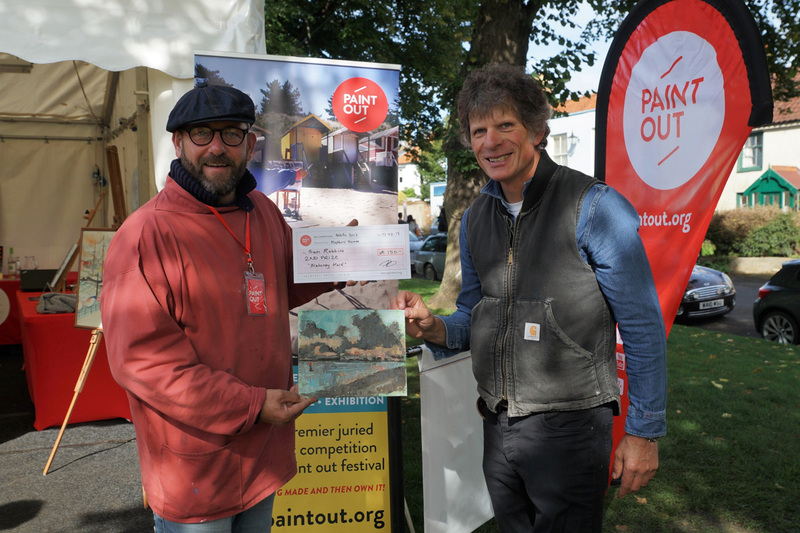 Jack, 40, from Norwich, won third prize at the first Paint Out Wells and was highly commended last year for his paintings of Brancaster Staithe. Hopkins Homes have graciously sponsored the prizes all three years and the second prize this year was awarded to newcomer Sam Robbins, a former EDP staff photographer, and who currently teaches GCSE photography at North Walsham High School. In 2014, he gained a Masters Degree in Fine Art from Norwich University of the Arts and has a piece of his work in the University Permanent Collection. So does one of the judges, now, as his prize piece “Blakeney Hard”, a sgraffito oil on cardboard work with scraped back paint effects of the sign and mooring posts at Blakeney Quay was sold along with another of Wells Ebb Tide. 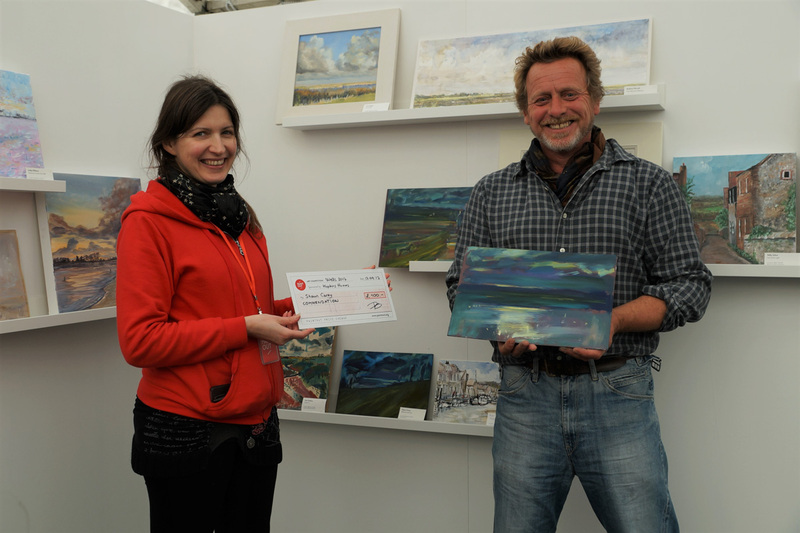 Judges’ individual commendations also went to Norfolk-based artists Sarah Muir Poland, Shaun Carey, and to Robert Nelmes – a winner at Paint Out Norwich 2016 and Royal Norfolk Show 2017 events. The occasional ‘Spirit of Plein Air’ award for artistic endeavour went to local North Norfolk artist Karen Adams, who interrupted a holiday in Spain to fly back and take part and who two-years running was first up to paint the sunrise between 5-6am. That’s commitment! Paint Out seeks to put raw, wet, unframed art, straight off the easel into the hands of new and seasoned art buyers alike. It challenges the assumption that gilt frames and established galleries are the only places to find Fine Art. Instead, we encourage art lovers to discover it ‘in-process’, watch it being created, and then own it, packaged in a posh ‘paint out’ pizza box to keep it pristine on its journey to a new home and frame of the purchaser’s choice. The organisers are grateful to the welcoming community of Wells-next-the-Sea and their support of our unique event. 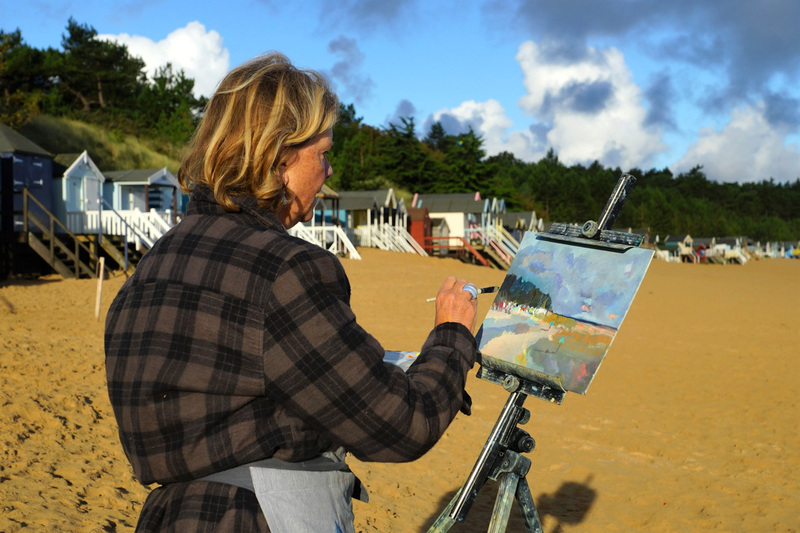 Wells residents are already wise to the fact that they live in a place that is a veritable paradise for artists with some of the best vantage points from which to paint the serene sights of the north Norfolk coast. Paint Out is confident that the event will grow and grow, returning next year.